Red Bull admit that their reliability problems are hampering their ability to fight for the championship. Sebastian Vettel retired from the Italian GP with an alternator failure, the second time such a problem has forced him out of a race this season. Team boss Christian Horner said the failures, the first of which happened when Vettel was dominating in Valencia in June were "extremely costly". "It's something that needs to be rectified," he added. Vettel's retirement at Monza was the second time over the weekend that the world champion had had an alternator failure. He also stopped in Friday practice with the same problem. The team's second driver, Mark Webber, also retired in Italy after a late spin badly damaged his tyres. It was the first time neither Red Bull had scored points since the 2010 Korean Grand Prix. It dropped Vettel, who was running sixth when he retired, to fourth in the championship, 39 points off leader Fernando Alonso of Ferrari, who finished third behind McLaren's Lewis Hamilton and Sergio Perez. Hamilton is second, two points ahead of Vettel and one ahead of Lotus's Kimi Raikkonen. Webber is fifth 47 adrift of Alonso. Red Bull's engine supplier Renault did have one other alternator failure in Monza - Lotus had to change one as a precaution after qualifying. The French company had made changes to the unit after Vettel's failure in Valencia, where Lotus driver Romain Grosjean retired for the same reason. The problem is one of internal heat build-up and rivals believe the design of the Red Bull may well exacerbate it. It is believed the Red Bull has a small battery for its Kers power-boost unit. If that is the case, it would mean the alternator would have to work harder in their car than in others. Horner said: "It's very disappointing but we need to work with Renault to try to understand it and make sure it doesn't happen again. "We need to find rectifications for the faults that have occurred. "DNFs [retirements] are extremely expensive. It's our first non-scoring race since Korea 2010. We can't afford to not be finishing races. "It makes the mountain higher but both the drivers are still in the race for the championship and we're leading the constructors by 19 points with seven races to go. We've just got to make sure we throw everything at it." 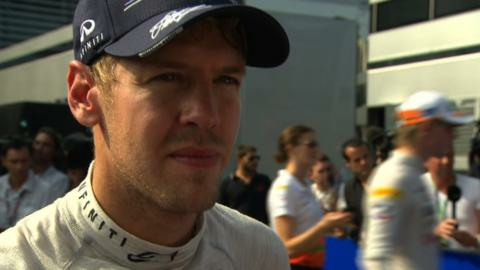 Vettel said: "We lost some points today. It doesn't help if the others are finishing and we don't. We did the best we could. The pace was not as strong as the leaders." Asked if he was confident he could still challenge for the title, he said: "Yeah, of course."